Hirving Lozano has scored 15 goals in 24 Eredivisie games for PSV this season. SAN JOSE, Calif. -- Mexico coach Gerardo "Tata" Martino is confident El Tri winger Hirving Lozano is ready to make the jump to an elite club in Europe should the PSV Eindhoven player decide to make a move this summer. 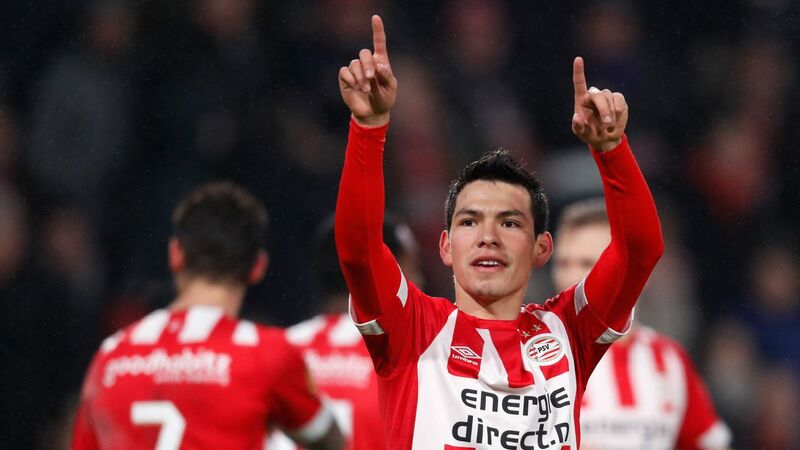 Lozano's name has been linked with Manchester United, Napoli and Paris Saint-Germain in recent weeks, with the 23-year-old netting 15 goals in 24 Eredivisie games this season, off the back of a good World Cup for Mexico. And Martino told ESPN FC at a news conference that Lozano is ready to take the next step: "In general, making a intermediary step to Dutch or Portuguese football for Latin players has been a tradition. "I think that Hirving has been in Holland a decent amount of time and has shown he's a valuable player that can make the jump to one of Europe's biggest institutions. "I'd be in agreement [with a move], but it's obviously the player's decision," he continued. "From the analysis side, is the player is now prepared? Absolutely, yes." Mexico faces Martino's former team Paraguay on Tuesday in Levi's Stadium, looking to build on last Friday's 3-1 victory over Chile, in which Lozano scored. Lozano would be following in fellow Mexico forward Javier Hernandez's footsteps if a move to United does happen, but Martino also thinks other Mexicans could comfortably play in European clubs, singling out Edson Alvarez for special praise. "If I had to throw out a name and say 'this player is ready to go,' it'd be Edson Alvarez," said Martino. "He's got World Cup experience, he's a regular starter in an institution as big as Club America and he's a player that gives you options in central midfield or at center-back. From my point of view, he's ready now." Martino isn't, however, happy with the ongoing back-and-forth with Porto over the availability of winger Jesus "Tecatito" Corona. The Mexico head coach had expressed his displeasure at Corona not turning up to camp despite carrying a left ankle injury, but Porto responded by saying the Mexican federation was aware that the 26-year-old wouldn't be traveling, something Martino denied. "You can believe me or not," said Martino. "When the other side wants to mimic the truth, I have to clear it up." Martino added that he wants to clear the situation up by speaking directly to the player. Finally, the former Barcelona manager said no decision has been made over whether 18-year-old Real Betis forward Diego Lainez will play at the Under-20 World Cup or the Gold Cup this summer and stated that Javier Hernandez had asked for permission to get married during camp last week in San Diego. Hernandez, Lainez and Jonathan dos Santos are all expected to start against Paraguay, in a much-changed side from that which defeated Chile.